Whether they were divers, sprinters, middle-distance swimmers or in their lanes for the long haul, there were six local swimmers and divers who have left their marks in their respective programs and have earned a spot on our 2017-18 All-Herald Swimming and Diving Team. Southington continued its tradition of producing strong swimmers and divers. This year the Blue Knights placed two athletes on our team. First is Southington’s Chase Galayda. In his three years at Southington High, Galayda has broken the 11-dive record every single year. Galayda finished eighth overall in Class LL in diving this season with a score of 409.40, the highest anyone has ever finished during head coach Evan Tuttle’s tenure at Southington. The junior also broke a 28-year-old school record, originally set in 1990 for the six-dive format. Galayda’s score was good enough for him to advance to the State Open, where he finished 11th overall with a score of 428.00. Galayda’s gymnastic background has been a key factor in his success on the diving board. Gymnastics is Galayda’s primary sport. He competes with the American Gymnastics Training Center, and while at states, he placed second. As a junior, Galayda still has some time before choosing colleges but wherever he may attend, he will do it with gymnastics and diving in mind. Southington’s Brendon Egan also places on our All-Herald team. In his senior year, Egan claimed the 100-butterfly conference title and was .47 away from beating the school record. During the 2016-17 season, Egan’s junior year, Southington was undefeated (11-0) and claimed the conference title. It was at the CCC meet where Egan took first in the 200-freestyle. In his sophomore year, Egan was the conference champion in the 100-backstroke, and since then he has been an all-conference selection every year. Egan will continue his swimming career at Springfield College next fall. Next on our All-Herald team is Newington’s Robert Nagy. Nagy was Newington’s first swimmer in nine years to qualify for the State Open. There, he placed 16th overall in the 50-freestyle with a time of 22.40. The two-year captain scored over 200 varsity points alone for Newington this season and received an all-conference selection for his efforts. Nagy is looking to continue his swimming career at the next level. Currently, Nagy is looking at Barton College, the University of Tampa, Florida Southern College and Southern Connecticut State University. Joining Brochu is teammate and senior Bryan Buckley. Buckley finished 17th with a score of 266.95 during the Class S state meet for diving. He also finished fifth at the CCC meet. The final member of our the All-Herald Swimming and Diving Team is Berlin junior Connor Recck. Recck played a pivotal role in Berlin’s success this season. He won every individual event that he swam in during the dual meet competition this year, earning valuable points for his team. At the CCC South conference meet, Recck became all-conference in four events, winning the 200-IM and 100-breaststroke and was a part of the first place 200-medley relay and second place 400-free relay. At the Class M meet, Recck finished fourth in the 100-freestyle with a personal best time of 48.99, and fourth in the 100-breaststroke with a new school record of 1:00.91. 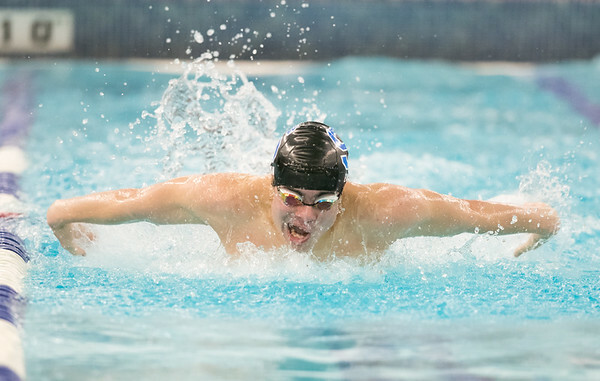 Recck qualified for the State Open in the 100-freestyle, where he finished 15th with a time of 48.67, and the 100-breaststroke, where he finished 21st with a time of 1:01.45. He also led off the 200-freestyle relay with a time of 22.76, which finished 19th and set a new school record of 1:31.77. Posted in New Britain Herald, Berlin, General Sports, Newington, Plainville, Southington on Tuesday, 10 April 2018 14:18. Updated: Tuesday, 10 April 2018 14:20.